DTaP (for diphtheria, tetanus and pertussis)–by 35 months, a child in the US should have 4 doses of the vaccine. Approximately 95% of this group of children, 19-35 months, have had the state mandated full series of vaccines (some require a series of 3, some a series of 4, and one doesn’t require pertussis at all). I suppose that several epidemics of pertussis (whooping cough) in a number of states over the past few years has motivated parents to make sure that their kids are fully vaccinated against pertussis. As I once discussed, not getting the full series of DTaP vaccination increases a child’s risk of contracting whooping cough by 2200%. Yes, 2200%. MMR (measles, mumps and rubella)–uptake of this vaccine, despite the fraudulent claims made about the vaccine by Mr. Andy Wakefield, has increased significantly to 94.7%, again right near the Healthy People 2020 goals. Varicella (chickenpox)–the vaccination rate for this potentially serious disease is at 96.6% for one dose, and 93.3% for the preferred two doses. There are several other interesting points about the data. For example, Mississippi, which has the literally the worst health care metrics in the USA, has a >99.7% vaccination rate for all three vaccines. Why? Because they only allow medical exemptions, no personal or religious ones. I want to congratulate Mississippi, but their health care system is so horrific, that I’m guessing that they are tough on vaccinations so that it doesn’t appear to be worse. But still, all states should immediately ban all exemptions but proven medical ones. The graphic above shows, generally, how exemptions and vaccination coverage is clustered across the USA. States with <90% coverage for the MMR vaccine (which starts to get to the level where the herd effect becomes lessened), also have higher rates of exemptions. States like Washington, Idaho, Colorado, Arkansas, Maine and the District of Columbia seem to have the worst situation. Some of the lower rate of MMR coverage may not result from exemptions but from the availability of the vaccines for the poor and others. This happens despite the fact that vaccines are factually free for any child in the USA. Immunization of U.S. children aged 19-35 months remains very high, with uptake of many routine vaccines (MMR, Chickenpox and DTaP) continuing to remain near or above 90 percent, according to this study. However, the study did uncover low vaccination rates for measles in some states (mostly in the West, including Colorado, Idaho, and Washington) are a concern to the CDC, and measles continues to cause outbreaks in communities with susceptible children and adults. As a cautionary fact, he CDC has reported a higher than normal number of measles cases so far this year in the United States and described recent outbreaks of the disease. 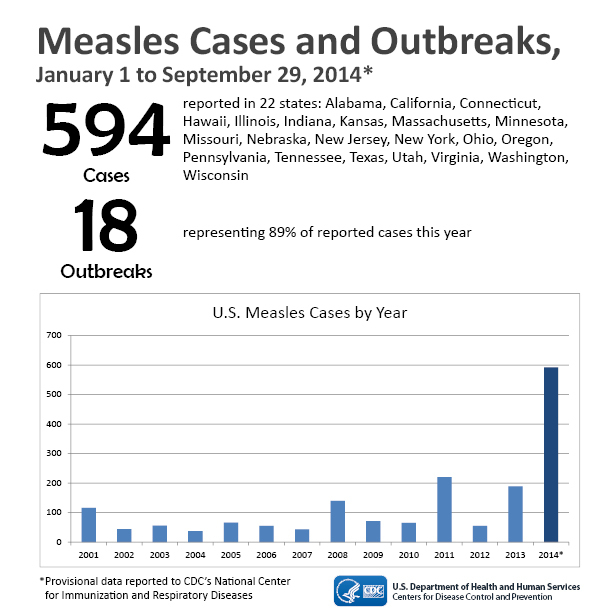 As of last month, there have been 594 cases of measles and 18 outbreaks. This was a disease once thought to be eradicated in the USA, and has come back simply because the vaccination rate has dropped in some areas of the country All of the measles cases reported in the United States are considered to be associated with importations from other countries, and most U.S. residents who got measles this year were unvaccinated due to philosophical objections to vaccination. That’s just bad news. Let me repeat something that I’ve said before. The antivaccine crowd really hasn’t had much of an effect if you take the broad population view of the USA. Antivaccine cultists are a tiny but obnoxiously loud group of people who lie, reject the scientific method of analysis, and create simplified memes that are meant to scare. They really haven’t made a general impact across the country, but in some regions, towns and communities, people reject real science to buy into the misinformation, thereby putting their children at harm. But, the pro-science side (that accepts the scientific consensus that vaccines are safe and effective) continues to tell the story, using real published scientific evidence, because any child saved from a vaccine-preventable disease is a child worth saving! 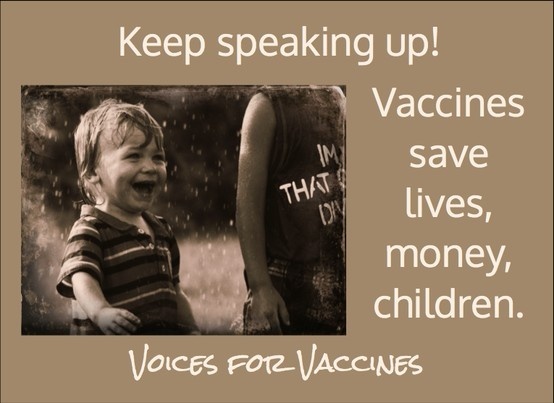 Because we know that vaccines save lives. Seither R, Masalovich S, Knighton CL, Mellerson J, Singleton JA, Greby SM. Vaccination coverage among children in kindergarten – United States, 2013-14 school year. MMWR Morb Mortal Wkly Rep. 2014 Oct 17;63(41):913-20. PubMed PMID: 25321068.